Mark Proshan at a sit-stand desk, one of hundreds of display pieces in Lexington Group’s 165,000-square-foot warehouse. In the 28 years Mark Proshan has been in the furniture-sales and office-design business, he has seen plenty of change, from a greater emphasis on open, collaborative spaces to more challenging timetable demands from clients. Through it all, though, he continues to cultivate a business philosophy built on relationships and trust — even at a time when many clients are more interested in speed and cost. Mark Proshan says he can count on one hand the number of contracts he’s drawn up over the years. He’d rather do business with a handshake. 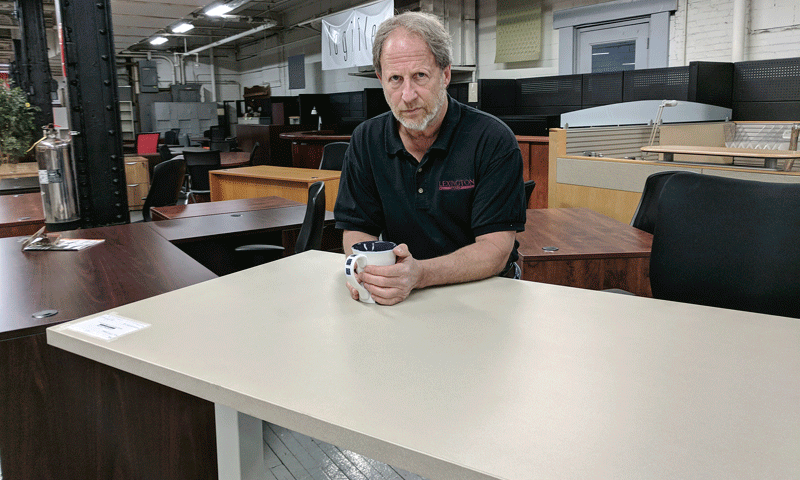 Proshan, owner of Lexington Group, which specializes in sales of new and refurbished office furniture as well as interior-design solutions, said he’s always been willing to lose money if it meant keeping a commitment he made to a customer. These philosophies are important in many businesses, but they’re especially relevant to someone who launched his company 28 years ago and has seen so many other facets of the business — from the products customers are looking for to the timetables they expect — change so much. “You need to adjust to what’s happening, to stay current,” Proshan said, and part of that is understanding clients’ shifting demands. 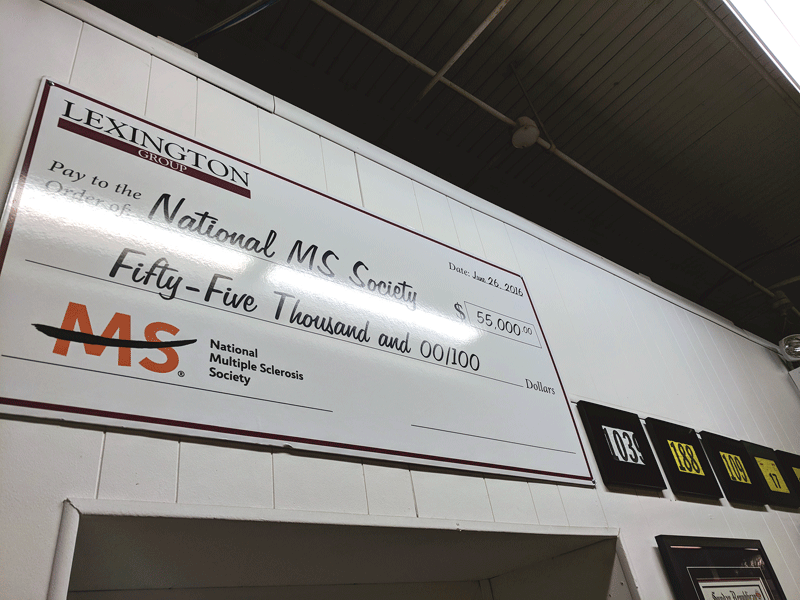 A long-time supporter of the National Multiple Sclerosis Society, Mark Proshan’s team raised $55,000 this year in the Bike MS: Cape Cod Getaway fund-raising bike ride. Proshan also has access to networks across the country, so a quick check of the Internet brings plenty more options for customers looking to change over an office, classroom, or retail space. For this issue’s focus on the modern office, Proshan explains how that idea — and the means by which companies hope to achieve it — have evolved. When he started the company, the mix of sales was about 60% pre-owned to 40% new, but it has reversed and is now 80% new and 20% pre-owned. The secondary-education market has long been an especially fertile niche for Lexington Group. “We typically have at least one or two trucks at one of the major colleges every day, whether it be UMass Amherst, Smith, Mount Holyoke, or somewhere else,” he said, noting that he also works with institutions in Worcester, Fitchburg, and the Boston area. 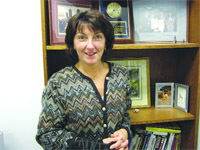 Other clients run the gamut from moderately sized insurance companies in Western Mass. to Fortune 500 firms across the Northeast. Across all these industries, certain trends have become ubiquitous. But there are challenges to opening up offices in this way, such as the occasional need for privacy for certain types of work, or when meeting clients. Most changes in office design are being driven by the younger generations and how they prefer to work, he said, but he also understands that the basic elements of his business — quality products and relationship-based service — remain constants. 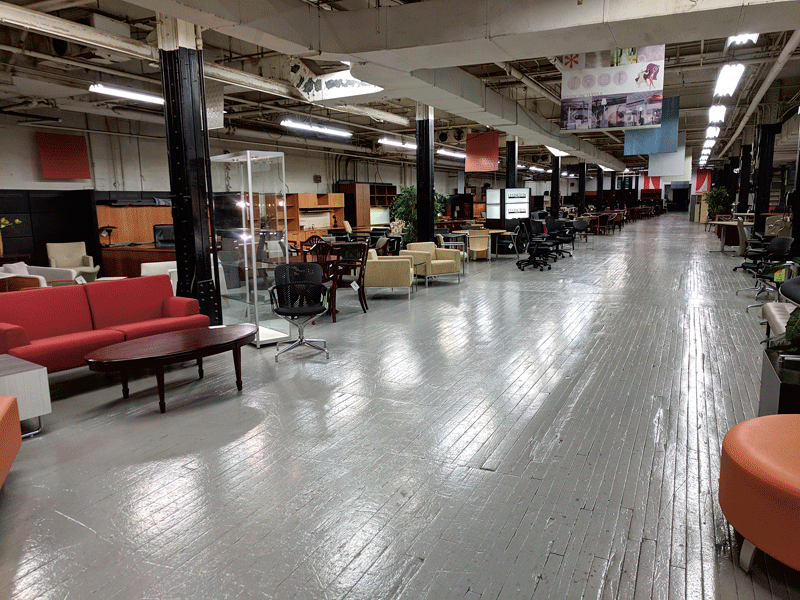 Lexington Group’s West Springfield warehouse gives a good indication of the range of new and refurbished items it sells. Other challenges include more remote employees working from home, the rise of online retail and how it has impacted local businesses, and, quite simply, business owners who prioritize the bottom line over all else when shopping for furniture. For Proshan, that’s not a satisfying way to do business. He said it was more common years ago for companies to have employees specifically focused on furniture and supply purchases and short- and long-term office planning, but that’s no longer the case. That emphasis on relationships informs the company’s civic involvement, particularly Proshan’s 21 years of involvement in the Bike MS: Cape Cod Getaway, an annual, 175-mile bike ride from Boston to Provincetown that raises money for the National Multiple Sclerosis Society. Last year, the team he has captained for 15 years raised $55,000. Back at work, though, his focus is where it has been for 28 years: helping companies improve their environment through better furniture and interior design.